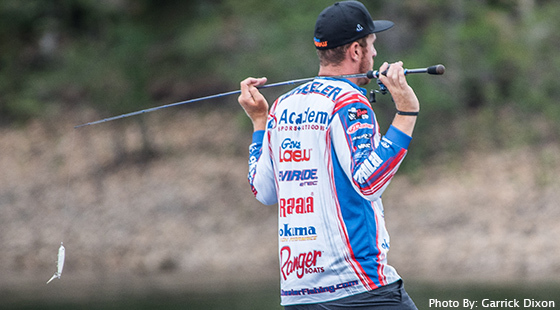 With Lake Ouachita laying out smooth as glass, Jacob Wheeler knew just what to do when a school of bass began busting shad on the first morning of the Forrest Wood Cup, the FLW Tour’s championship tournament – toss an Arashi® Top Walker on top of them as soon as possible. His instincts nearly netted him his second Cup trophy in four tries. After leading the field the first and third days, the Rapala pro finished in fourth. And based on the “slick-calm” condition of the water and weather on Day 1, Wheeler knew the bait to get them to bite would be a Top Walker, Storm®’s newest offering in its popular Arashi line-up. That’s a position Wheeler’s used to in Forrest Wood Cups – in his five appearances, he’s never finished outside of the top 12. He won it in 2012, finished runner-up in 2013, came in 10th in 2014, 12th in 2011, and now fourth. He’s the youngest angler to win the Forrest Wood Cup. And if stormy weather hadn’t “jacked up the fish” in one of his primary areas on the last day, he stood a good chance to repeat as champion. He started the final day with a 12-ounce lead over the closest competitor. Previously, he had jumped to an early lead, finishing the first day in first place with a 1-pound, 2-ounce cushion over the nearest rival. Available in both a 4-1/4 and 5-1/8 inch models, the Arashi Top Walker walks the dog even when retrieved fast, having been purpose-built to eliminate the missed opportunities all too common with lesser topwater options. Partially flattened sides prevent it from rolling as it changes direction on the retrieve. “It’s something just a little bit different than anything else on the market,” Wheeler says. The X-Rap® tail triggers strikes by imitating the action of a minnow’s tail. A VMC® round-bend premium treble, it’s forged from the finest high-carbon steel. A chemically sharpened cone-cut point provides extremely fast and effortless penetration power. “There’s just something about feathered trebles sometimes that acts more like a little baitfish, or small shad,” Wheeler says. And those are just the conditions Wheeler encountered each morning in the Cup. Making long casts with the Top Walker to schooling bass was productive from about 7 to 9 a.m. on the first three of the tournament’s three days. His best color pattern was Ghost Pearl Shad. In the mornings, he targeted offshore fish suspending at about 20 feet in 50 feet. Shallower pockets with really clear water saw the Top Walker too. In addition to a long-glide, walk-the-dog action, Top Walkers feature four bearings that broadcast a variable pitch frequency, mimicking the sound of schooling baitfish. Wheeler threw his Top Walker on 17-pound-test Sufix® Siege monofilament line. This was critical because monofilament line floats, keeping the bait running true and on the surface. It also has a good amount of stretch which helps to keeps from tearing the hooks from fish as they near the boat. On the tournament’s final morning, Wheeler found less success with a brand-new bait, and more with a seasoned classic – a Blue Fox® Vibrax. Although Wheeler didn’t recall the exact size and model of the Vibrax he used, all Vibrax in-line spinners feature a single treble hook trailing at least one Colorado or willow-style blade. The key feature is a unique Vibrax bell, which emits sonic vibration when a free-turning gear rubs against it. Wheeler threw the Vibrax with a spinning rod on 6-pound test Sufix NANOBRAID®, a new ultra-thin superline released in July. “That NANOBRAID would allow me cast so much further and get it into those schools,” Wheeler says. This entry was posted in Pro Staff, Rapala and tagged Arashi Top Walker, Blue Fox, Dressed X-Rap Treble, Jacob Wheeler, NANOBRAID, round-bend treble hook, Siege monofilament line, Storm, Sufix, VMC. Bookmark the permalink.